Hello! Welcome to my new blog. I thought to introduce this and get started i would share an interview that i did for issue 56 of The Green Parent magazine. I hope you enjoy it. 1)-What inspired you to start babywearing? My wife, Zena, was inspired to start babywearing by a friend that she had met in a pregnancy yoga class. I was interested and loved the practicality of it but despite Zena’s efforts I didn’t try it for myself for a long time. It always looked a bit fiddly for me as a big clumsy guy and she did it so well that there didn’t feel like much need. When Zena went back to work my shift work meant that I had days off in the week where I would look after our daughter, Eden, on my own. I tried a napsak mei tai one day when in a rush to get to a musical tots group and loved the way it felt and how easy it was to get about and have my hands free to carry bags and do other things. I showed Zena my achievement when she got in from work and she was very happy and showed me ways to make it more comfortable and other ways of wearing. 2)-Can you describe your babywearing history? I used the napsak and didn’t really look into anything else until Eden started to outgrow it. Zena had tried to get me a buckled carrier because she thought I’d like it but the one she got didn’t fit me. We ended up getting me a pre-loved wrap conversion mei tai and it was with this that I did my first ever back carry. The feeling the first time Eden snuggled down and fell asleep on my back was incredible. I got another mei tai that was more structured and had seat darts and padded straps and I was hooked. I loved it and I would wear Eden at every opportunity. When my son, Ezra, was born I started wearing him from the very beginning, at 1 day old putting him on my front in a close carrier and taking him down stairs so my wife could get some well needed sleep. I then realised what I had missed in not wearing Eden at this early stage. It was at this time that I found the slingdads group on Facebook. It was started by an amazing guy called Simon who was looking for a place to find Dads like him but couldn’t find it so made his own. It was just what I needed at the time and it was brilliant speaking to likeminded dads. I started becoming interested in woven wraps and would try Zena’s with varying degrees of success but she didn’t have anything long enough for me to front carry with. I got my first woven wrap, a size 7 storchenwiege and I used so much that I soon got myself more wraps. I learned to do other carries and to back wrap and now can’t believe I didn’t do this sooner. I’ve worn Ezra lots in the first year of his life, although he’s been exclusively breastfed we’ve been buddies from birth. I could read him, soothe him and understand his needs. I felt equal as a caregiver and not on the side-lines. Babywearing has enabled me to be the dad I wanted to be but was not sure how to be. It sounds crazy that a piece of material can do this but it really has. I found slings were a great way to help soothe Ezra when he was a new-born. I’ve heard that the warmth and motion mimics feeling of being in the womb, it has been referred to as the fourth trimester. Being able to do something so intimate with my new-born which made him so happy was such a blessing and allowed my wife time to rest or to have some really important one to one time with Eden. 3)-What is your favourite sling and why? That’s a big question for me because I love them all. But if I had to narrow it down I would pick: my natibaby oogas wrap, my Fire Spirals seafoam wrap and my Oscha Orion wrap. All three mean a lot to me for very different reasons. Oogas was the first sling I saw that made me think ‘wow, I need to learn how to do that!’. Seafoam was made by a small British company in Bolton, and aside from being beautiful they are the comfiest, easiest to wrap with slings I’ve used. And lastly, Orion. The online sling world is a very big one. During my journey through babywearing I have met some genuinely amazing and kind people. After an accident left me unable to carry my children for a few weeks some of these online friends got together and bought Orion for me and presented it to me at the European babywearing conference in Bristol. I was overwhelmed and emotional that a group of people I’d never met could do something that would mean so much to me. 4)-What advice would you give to dads eager to try babywearing? 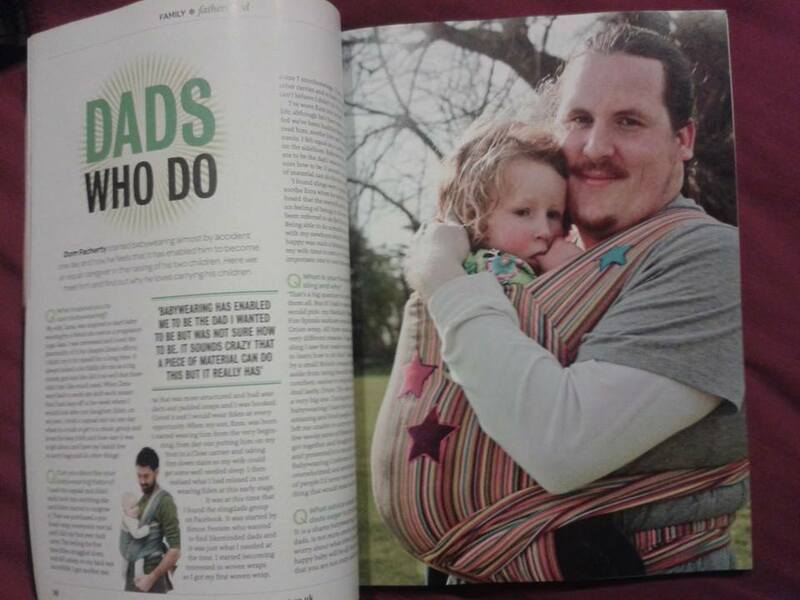 It is a shame babywearing, especially by dads is not more commonplace, but don’t worry about what other people think. Your happy baby will be all the proof you need that you are not crazy and wrapping your baby is a large cloth, mei tai or buckled carrier is a great thing to do! It is such a wonderful and easy way to bond with your children. There is nothing better than walking along with Eden on my back chatting in my ear about everything she can see. If she was in a pushchair I would not be able to hear her and would have missed out on so many wonderful conversations. Babywearing allows us to discover together and be together. I also like how safe children seem to feel in slings, they can gauge your reactions in unfamiliar situations rather than being pushed into them first with nowhere to hide. People always comment how happy and content they seem when they are in the sling. 5)-I loved the calendar that you created last year. What are your future plans with Slingdads? The calendar was so much fun and raised a lot of money for our charities, and not just because my mum bought a copy for everyone she knows! We aren’t planning on doing one this year though as there is a fantastic “Naked Babywearing” calendar being made by a group of mums in the north east that we will be supporting and hoping as many people buy it as possible. We have recently hosted a workshop at the European Babywearing Conference which was great and we gained some great ideas for moving forward. We have since started the website and forum slingdads.co.uk – on the site we have sling reviews and information on carries and carriers and tutorials. We have a YouTube channel where we have some great montage videos and some of our wrap tutorials made by me and other dads. Next year we will be having the first (hopefully of many) Slingdads Camp which we are all very excited about. We hope that this will involve activities for children and adults, entertainment, merchandise and a marketplace for retailers. We are hoping to have male babywearing consultants and peer supporters trained who will be running classes and informal drop in tips and tricks sessions. It’s still in the planning stage but keep an eye on the forum, website and Facebook page for more details. 6)-Please can you give us a brief biog about yourself (first name of partner, first name and ages of kids, county where you live) so that we can put your comments into context. I’m Dom, a 31 year old from Reading, Berkshire. I’m married to Zena and we have a 3 year old daughter Eden and a 1 year old son Ezra. I work at Reading University as a security controller and Zena works at Reading University students union as a student money and housing advisor.